Yes! Eggs are a fantastic source of protein, vitamins and minerals. See our EGG FACTS page or the INCREDIBLE EGG website for more information about the nutritional benefits of eggs. ARE ONLY BROWN EGGS ORGANIC? No. Although organic eggs found in grocery stores in the United States are typically brown, the shell color is not an indicator that the egg is organic. For an egg to be organic it must come from hens that are cage-free, fed organic feed and given access to the outdoors. DO YOU NEED A ROOSTER FOR HENS TO LAY AN EGG? No. 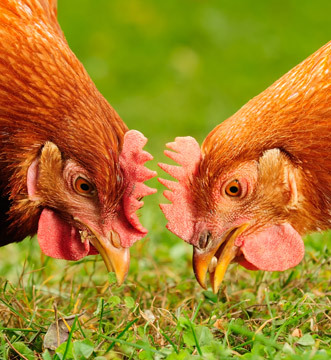 Chickens will lay about one egg per day regardless of if a rooster is present or not. Pullet is the word for a female chick – it is a baby hen. CAN EGGS BE EATEN AFTER THE SELL BY DATE? Yes. As long as eggs are stored at 45°F or lower they are safe to be consumed 4 to 5 weeks after the Julian date. Look HERE for more egg safety information. WHY ARE SOME YOLKS LIGHT YELLOW AND OTHERS ARE DARK? The color of the yolk is dependent on the diet of the hens. Wheat-based diets tend to produce lighter yolks while corn-based diets generally yield darker yolks. Our hens typically lay about one egg each day. Yes, the USDA requires that eggs be cleaned and washed before packing to reduce the risk of disease and contaminants. 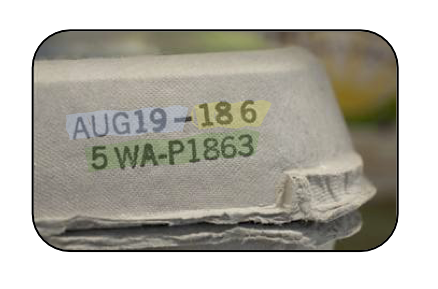 JULIAN DATE: Date the eggs were packaged on – it is the number day in the year starting with January 1st as 001. SELL BY DATE: Date the store needs to sell the eggs by AUG19. PLANT NUMBER: Number used to identify the specific plant the eggs were packaged in. In this case the eggs were packed by plant number 5WA-P1863.